The technicians at Hendersonville Muffler Company have been repairing charging systems and replacing generators, voltage regulators, alternators, rectifiers, PCM units and more for over 38 years. We repair all of the automotive electrical systems in cars and trucks here in Hendersonville, but without the generator or alternator working correctly to charge the battery none of the other electrical items will work very well. As I mentioned earlier the technicians at Hendersonville Muffler Company have been repairing charging systems for many years. We have serviced thousands of charging systems. We know how to diagnose and repair the problems with any car or truck. We have all sorts of specialty tools and test equipment designed to help us quickly and correctly diagnose exactly what is wrong with your charging system. Of course all the tools in the world won't help you fix automotive charging systems if you don't have the training to use them. Our technicians have formal training in automotive electrical systems including, (but not limited to), the charging system. Our technicians fully understand automotive electrical systems and we consider them to be fairly simple because we repair them every day. Many times we find the problems other shops miss such as loose cables, grounds, and missing ground straps. Our technicians are trained to look at the simplest things first and then re-test. We have repaired a tremendous amount of cars and trucks repairing just the simplest of issues such as battery cables and loose connections. Our technicians are trained not to overlook the basics in order to keep simple repairs simple. The charging system is important in any car but is especially important in newer, fuel injected cars and trucks. The computer and all of the electrical devices in a car or truck operate off of the battery and not the alternator. Modern cars also utilize more electronics in the charging system because the engine management computer, (it's actually named the electronic control module) now controls the charging system. Electrical devices do not like to operate without the correct voltage. 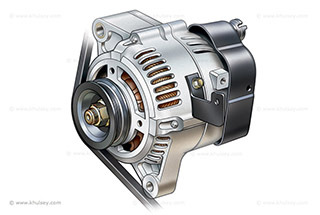 Trust all of your automotive alternator and charging system repairs to the experts at Hendersonville Muffler Company. You will quickly see why the people of Hendersonville, Tennessee have been trusting their auto repairs to Hendersonville Muffler Company.